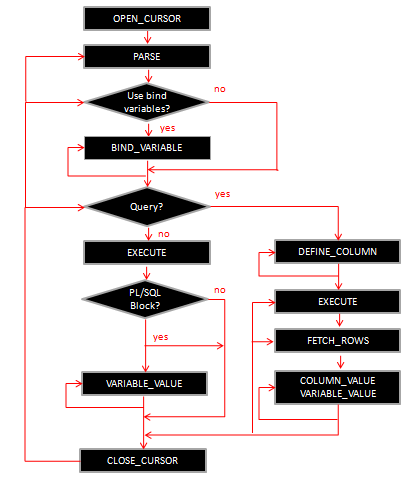 Note DBMS_SQL is the traditional form of dynamic SQL in Oracle. For most purposes native dynamic sql (NDS) will be the dynamic SQL engine of choice but there are some things this package can do that can not be done any other way or certainly not with equal ease. This page emphasizes some of those areas where there is no substitute. Clearly no one at Oracle pays sufficient intention to database security. The grant of EXECUTE to PUBLIC should be dropped. Gets the statement of the next result returned to the caller of the recursive statement or, if this caller sets itself as the client for the recursive statement, the next result returned to this caller as client. Level 0 allows all DBMS_SQL operations on the cursor without any security checks. The cursor may be fetched from, and even re-bound and re-executed, by code running with a different effective userid or roles than those in effect at the time the cursor was parsed. This level of security is off by default. Level 1 requires that the effective userid and roles of the caller to DBMS_SQL for bind and execute operations on this cursor must be the same as those of the caller of the most recent parse operation on this cursor. Level 2 requires that the effective userid and roles of the caller to DBMS_SQL for all bind, execute, define, describe, and fetch operations on this cursor must be the same as those of the caller of the most recent parse operation on this cursor. -- set the length to the remaining size ... if there are < c_buf_len characters remaining.